Mahesh Bhupathi is a Indian professional tennis player and a former World No. 1. in Men's Doubles.Currently ranking as the worlds Number 5.He is is a magnificent tennis player.You want to know more about Mahesh Bhupathi Tennis career, biography and profile then read the full article. Mahesh Shrinivas Bhupathi born 7 June 1974 in Chennai,India.Mahesh Bhupahti, has been a world-class in tennis doubles, he won to date ( as of June 2011 ) 48 tournaments on the ATP tour in doubles and mixed several Grand Slam titles.While Mahesh Bhupathi gained mainly as a partner Leander Paes attention, at whose side he won 25 titles. The so-called "Indian Express" has a particularly impressive record in Davis Cup : since 1996 have Bhupathi and Paes no doubles in the Davis Cup lost more that two Indians have been there now 14 games unbeaten. 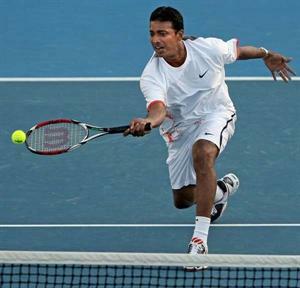 Since the late 1990s, Bhupathi limited to the double. His career highlight in the individual he saw in February 1996 when he was in Jaipur ( India ) with wins over Jan Siemerink and Jacco Eltingh the way for his team's 3-2 win against the Netherlands paved. Bhupahti throughout his career had several doubles partner. Together with Max Mirnyi and Mark Knowles , among other things, he could win several titles each. The best record he has with his compatriot Leander Paes , at whose side he first played at the beginning of career to 2002. After a long pause, play the two back together since the 2011 season. In 2001 he was awarded the Padma Shri award. Too much space after each heading.Please correct it.